n-Butyllithium, an organometallic compound. 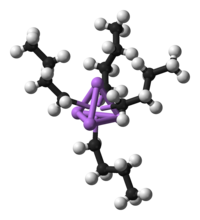 Four lithium atoms (in purple) form a tetrahedron, with four butyl groups attached to the faces (carbon is black, hydrogen is white). Organometallic chemistry is the study of organometallic compounds, chemical compounds containing at least one chemical bond between a carbon atom of an organic molecule and a metal, including alkaline, alkaline earth, and transition metals, and sometimes broadened to include metalloids like boron, silicon, and tin, as well. Aside from bonds to organyl fragments or molecules, bonds to 'inorganic' carbon, like carbon monoxide (metal carbonyls), cyanide, or carbide, are generally considered to be organometallic as well. Some related compounds such as transition metal hydrides and metal phosphine complexes are often included in discussions of organometallic compounds, though strictly speaking, they are not necessarily organometallic. The related but distinct term "metalorganic compound" refers to metal-containing compounds lacking direct metal-carbon bonds but which contain organic ligands. Metal β-diketonates, alkoxides, dialkylamides, and metal phosphine complexes are representative members of this class. The field of organometallic chemistry combines aspects of traditional inorganic and organic chemistry. Organometallic compounds are widely used both stoichiometrically in research and industrial chemical reactions, as well as in the role of catalysts to increase the rates of such reactions (e.g., as in uses of homogeneous catalysis), where target molecules include polymers, pharmaceuticals, and many other types of practical products. Organometallic compounds are distinguished by the prefix "organo-" e.g. organopalladium compounds. Examples of such organometallic compounds include all Gilman reagents, which contain lithium and copper. Tetracarbonyl nickel, and ferrocene are examples of organometallic compounds containing transition metals. Other examples include organomagnesium compounds like iodo(methyl)magnesium MeMgI, dimethylmagnesium (Me2Mg), and all Grignard reagents; organolithium compounds such as n-butyllithium (n-BuLi), organozinc compounds such as diethylzinc (Et2Zn) and chloro(ethoxycarbonylmethyl)zinc (ClZnCH2C(=O)OEt); and organocopper compounds such as lithium dimethylcuprate (Li+[CuMe2]−). In addition to the traditional metals, lanthanides, actinides, and semimetals, elements such as boron, silicon, arsenic, and selenium are considered to form organometallic compounds, e.g. organoborane compounds such as triethylborane (Et3B). Ferrocene is an archetypal organoiron complex. It is an air-stable, sublimable compound. Cobaltocene is a structural analogue of ferrocene, but is highly reactive toward air. Tris(triphenylphosphine)rhodium carbonyl hydride is used in the commercial production of many aldehyde-based fragrances. Zeise's salt is an example of a transition metal alkene complex. Dimethylzinc has a linear coordination. It is a volatile pyrophoric liquid that is used in the preparation of semiconducting films. Many complexes feature coordination bonds between a metal and organic ligands. The organic ligands often bind the metal through a heteroatom such as oxygen or nitrogen, in which case such compounds are considered coordination compounds. However, if any of the ligands form a direct M-C bond, then complex is usually considered to be organometallic, e.g., [(C6H6)Ru(H2O)3]2+. Furthermore, many lipophilic compounds such as metal acetylacetonates and metal alkoxides are called "metalorganics." A naturally occurring transition metal alkyl complex is methylcobalamin (a form of Vitamin B12), with a cobalt-methyl bond. This subset of complexes is often discussed within the subfield of bioorganometallic chemistry. Illustrative of the many functions of the B12-dependent enzymes, the MTR enzyme catalyzes the transfer of a methyl group from a nitrogen on N5-methyl-tetrahydrofolate to the sulfur of homocysteine to produce methionine. The status of compounds in which the canonical anion has a delocalized structure in which the negative charge is shared with an atom more electronegative than carbon, as in enolates, may vary with the nature of the anionic moiety, the metal ion, and possibly the medium; in the absence of direct structural evidence for a carbon–metal bond, such compounds are not considered to be organometallic. For instance, lithium enolates often contain only Li-O bonds and are not organometallic, while zinc enolates (Reformatsky reagents) contain both Zn-O and Zn-C bonds, and are organometallic in nature. The metal-carbon bond in organometallic compounds is generally highly covalent. For highly electropositive elements, such as lithium and sodium, the carbon ligand exhibits carbanionic character, but free carbon-based anions are extremely rare, an example being cyanide. As in other areas of chemistry, electron counting is useful for organizing organometallic chemistry. The 18-electron rule is helpful in predicting the stabilities of metal carbonyls and related compounds. Most organometallic compounds do not however follow the 18e rule. Chemical bonding and reactivity in organometallic compounds is often discussed from the perspective of the isolobal principle. As well as X-ray diffraction, NMR and infrared spectroscopy are common techniques used to determine structure. The dynamic properties of organometallic compounds is often probed with variable-temperature NMR and chemical kinetics. Early developments in organometallic chemistry include Louis Claude Cadet's synthesis of methyl arsenic compounds related to cacodyl, William Christopher Zeise's platinum-ethylene complex, Edward Frankland's discovery of diethyl- and dimethylzinc, Ludwig Mond's discovery of Ni(CO)4, and Victor Grignard's organomagnesium compounds. (Though not always acknowledged as an organometallic compound, Prussian blue, a mixed-valence iron-cyanide complex, was first prepared in 1706 by paint maker Johann Jacob Diesbach as the first coordination polymer and synthetic material containing a metal-carbon bond.) The abundant and diverse products from coal and petroleum led to Ziegler–Natta, Fischer–Tropsch, hydroformylation catalysis which employ CO, H2, and alkenes as feedstocks and ligands. Recognition of organometallic chemistry as a distinct subfield culminated in the Nobel Prizes to Ernst Fischer and Geoffrey Wilkinson for work on metallocenes. In 2005, Yves Chauvin, Robert H. Grubbs and Richard R. Schrock shared the Nobel Prize for metal-catalyzed olefin metathesis. 1899 John Ulric Nef discovers alkynylation using sodium acetylides. 1951 Walter Hieber was awarded the Alfred Stock prize for his work with metal carbonyl chemistry. Organometallic compounds find wide use in commercial reactions, both as homogeneous catalysis and as stoichiometric reagents For instance, organolithium, organomagnesium, and organoaluminium compounds, examples of which are highly basic and highly reducing, are useful stoichiometrically, but also catalyze many polymerization reactions. Almost all processes involving carbon monoxide rely on catalysts, notable examples being described as carbonylations. The production of acetic acid from methanol and carbon monoxide is catalyzed via metal carbonyl complexes in the Monsanto process and Cativa process. Most synthetic aldehydes are produced via hydroformylation. The bulk of the synthetic alcohols, at least those larger than ethanol, are produced by hydrogenation of hydroformylation-derived aldehydes. Similarly, the Wacker process is used in the oxidation of ethylene to acetaldehyde. Almost all industrial processes involving alkene-derived polymers rely on organometallic catalysts. The world's polyethylene and polypropylene are produced via both heterogeneously via Ziegler–Natta catalysis and homogeneously, e.g., via constrained geometry catalysts. Most processes involving hydrogen rely on metal-based catalysts. Whereas bulk hydrogenations, e.g. margarine production, rely on heterogeneous catalysts, For the production of fine chemicals, such hydrogenations rely on soluble organometallic complexes or involve organometallic intermediates. Organometallic complexes allow these hydrogenations to be effected asymmetrically. A constrained geometry organotitanium complex is a precatalyst for olefin polymerization. Many semiconductors are produced from trimethylgallium, trimethylindium, trimethylaluminium, and trimethylantimony. These volatile compounds are decomposed along with ammonia, arsine, phosphine and related hydrides on a heated substrate via metalorganic vapor phase epitaxy (MOVPE) process in the production of light-emitting diodes (LEDs). The synthesis of many organic molecules are facilitated by organometallic complexes. Sigma-bond metathesis is a synthetic method for forming new carbon-carbon sigma bonds. Sigma-bond metathesis is typically used with early transition-metal complexes that are in their highest oxidation state. Using transition-metals that are in their highest oxidation state prevents other reactions from occurring, such as oxidative addition. In addition to sigma-bond metathesis, olefin metathesis is used to synthesize various carbon-carbon pi bonds. Neither sigma-bond metathesis or olefin metathesis change the oxidation state of the metal. Many other methods are used to form new carbon-carbon bonds, including beta-hydride elimination and insertion reactions. Organometallic complexes are commonly used in catalysis. Major industrial processes include hydrogenation, hydrosilylation, hydrocyanation, olefin metathesis, alkene polymerization, alkene oligomerization, hydrocarboxylation, methanol carbonylation, and hydroformylation. Organometallic intermediates are also invoked in many heterogeneous catalysis processes, analogues to those listed above. Additionally, organometallic intermediates are assumed for Fischer-Tropsch process. Organometallic complexes are commonly used in small-scale fine chemical synthesis as well, especially in cross-coupling reactions that form carbon-carbon bonds, e.g. Suzuki-Miyaura coupling, Buchwald-Hartwig amination for producing aryl amines from aryl halides, and Sonogashira coupling, etc. Natural and contaminant organometallic compounds are found in the environment. Some that are remnants of human use, such as organolead and organomercury compounds, are toxicity hazards. Tetraethyllead was prepared for use as a gasoline additive but has fallen into disuse because of lead's toxicity. Its replacements are other organometallic compounds, such as ferrocene and methylcyclopentadienyl manganese tricarbonyl (MMT). The organoarsenic compound roxarsone is a controversial animal feed additive. In 2006, approximately one million kilograms of it were produced in the U.S alone. Roxarsone is an organoarsenic compound used as an animal feed. ^ a b c Crabtree, Robert H. (2009). The Organometallic Chemistry of the Transition Metals (5th ed.). New York, NY: John Wiley and Sons. pp. 2, 560, and passim. ISBN 978-0470257623. Retrieved 23 May 2016. ^ a b Oliveira, José; Elschenbroich, Christoph (2006). Organometallics (3., completely rev. and extended ed.). Weinheim: Wiley-VCH-Verl. ISBN 978-3-527-29390-2. ^ Berg, Jeremy M.; Lippard, Stephen J. (1994). Principles of bioinorganic chemistry ([Pbk. ed.]. ed.). Mill Valley: University Science Books. ISBN 978-0-935702-73-6. ^ Hunt, L. B. (1984). "The First Organometallic Compounds: William Christopher Zeise and his Platinum Complexes" (PDF). Platinum Metals Rev. 28 (2): 76–83. ^ Zeise, W. C. (1831). "Von der Wirkung zwischen Platinchlorid und Alkohol, und von den dabei entstehenden neuen Substanzen". Annalen der Physik. 97 (4): 497–541. Bibcode:1831AnP....97..497Z. doi:10.1002/andp.18310970402. ^ Dragutan, V.; Dragutan, I.; Balaban, A. T. (2006). "2005 Nobel Prize in Chemistry". Platinum Metals Review. 50 (1): 35–37. doi:10.1595/147106706X94140. ISSN 0032-1400. ^ Leeuwen, Piet W.N.M. van (2004). Homogeneous catalysis : understanding the art. Dordrecht: Springer. ISBN 978-1-4020-3176-2. ^ Klosin, Jerzy; Fontaine, Philip P.; Figueroa, Ruth (2015). "Development of Group IV Molecular Catalysts for High Temperature Ethylene-α-Olefin Copolymerization Reactions". Accounts of Chemical Research. 48 (7): 2004–2016. doi:10.1021/acs.accounts.5b00065. ISSN 0001-4842. PMID 26151395. ^ Waterman, Rory (2013-12-23). "σ-Bond Metathesis: A 30-Year Retrospective". Organometallics. 32 (24): 7249–7263. doi:10.1021/om400760k. ISSN 0276-7333. ^ "The Organometallic HyperTextBook: Olefin Metathesis". www.ilpi.com. Retrieved 2017-12-26. ^ "Organometallic HyperTextBook: Sigma Bond Metathesis". www.ilpi.com. Retrieved 2017-12-26. ^ Jana, Ranjan; Pathak, Tejas P.; Sigman, Matthew S. (2011-03-09). "Advances in Transition Metal (Pd,Ni,Fe)-Catalyzed Cross-Coupling Reactions Using Alkyl-organometallics as Reaction Partners". Chemical Reviews. 111 (3): 1417–1492. doi:10.1021/cr100327p. ISSN 0009-2665. PMC 3075866. PMID 21319862. ^ Maluenda, Irene; Navarro, Oscar (2015-04-24). "Recent Developments in the Suzuki-Miyaura Reaction: 2010–2014". Molecules. 20 (5): 7528–7557. doi:10.3390/molecules20057528. PMC 6272665. PMID 25919276. ^ Magano, Javier; Dunetz, Joshua R. (2011-03-09). "Large-Scale Applications of Transition Metal-Catalyzed Couplings for the Synthesis of Pharmaceuticals". Chemical Reviews. 111 (3): 2177–2250. doi:10.1021/cr100346g. ISSN 0009-2665. PMID 21391570. ^ Seyferth, D. (2003). "The Rise and Fall of Tetraethyllead. 2". Organometallics. 22 (25): 5154–5178. doi:10.1021/om030621b. ^ Hileman, B. (April 9, 2007). "Arsenic in Chicken Production". Chemical and Engineering News. pp. 34–35. Elschenbroich, Christoph (2016). Organometallics (3rd ed.). New York, NY: John Wiley and Sons. ISBN 978-3527805143. Retrieved 23 May 2016. Crabtree, Robert H. (2009). The Organometallic Chemistry of the Transition Metals (5th ed.). New York, NY: John Wiley and Sons. ISBN 978-0470257623. Retrieved 23 May 2016. Jenkins, Paul R. (1992). Organometallic Reagents in Synthesis. Oxford Chemistry Primers, No. 3. Oxford, UK: Oxford University Press. ISBN 978-0198556664. ISSN 1367-109X. Retrieved 23 May 2016. Pearson, Anthony J. (1985). Metallo-organic Chemistry. New York, NY: John Wiley and Sons. ISBN 978-0471904465. Retrieved 23 May 2016.